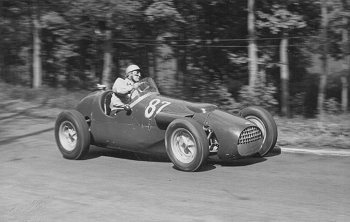 John Webb driving a 2 litre, Formula 2 Turner car at Prescott in 1955. Courtesy of the late Jim Boulton. Welsh engineer and motor racing enthusiast Jack Henry Turner was born in Abergavenny on the 1st April 1916. He moved to the Midlands and soon after the war had premises at Seisdon near Wolverhampton. Turner himself raced an MG and was attracted by Coopers kit-car ides for MG power, and built himself a similar twin–tube frame with transverse leaf independent suspension front and rear." 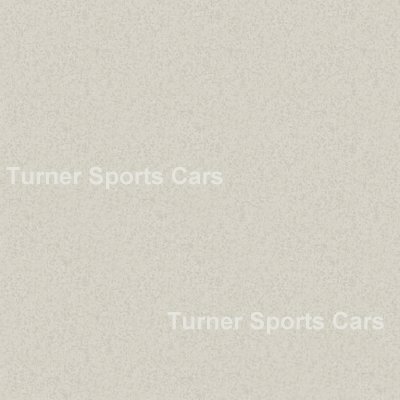 When someone asked him for another one "just like that", Turner went into business in a small way and built a handful of sports cars. The enthusiastic private owner-driver, John Webb (born Hagley 14th March 1913), the chairman and joint managing director of Webb Corbett Ltd. the well-known Stourbridge glass company, asked Turner to convert his ex Reg Parnell MG K3 Magnette into a single seater. It had a unique twin cam headed MG engine converted by Laurence Pomeroy. It would appear that this car became known as a Turner. John Webb raced the car at Boreham on the 30th June 1956, in a race for cars of up to 2000cc un-supercharged and supercharged cars of up to 1100cc. But there is no record of how it performed. It then appeared in a similar race over 5 laps at Goodwood on the 29th September, John finishing 7th some 44 seconds behind winner, Stirling Moss in a Formula 2 HWM Alta. John then ran the car in a Formula Libre race at a Nottingham Sports Car Club meeting at Silverstone on the 11th October 1952. The Autosport report referred to the car as an MG based Turner. It went on to say that "Leslie Marr came very fast into Woodcote in the Formula 2 Type 'A' Connaught slid wildly to a halt in the path of Webb’s Turner. Webb could do nothing about it at all, and smote the Connaught violently, the two cars remaining locked together in mid-fairway". The car passed into the hand of the Rolls brothers from Newbury, who entered the car in a 20 lap Formula Libre handicap race at Davidstow in Cornwall on the 7th June 1954 and again for a similar race at the meeting on 2nd August, when G Rolls drove the 1087cc supercharged car. But there is no record of where he finished. His brother, J Rolls, won the race in a Cooper Bristol Sports car. Shortly afterwards the car was advertised for sale in "Autosport": "1100cc 2-stage blown, twin camshaft TURNER single seater. Cost over £3000 in 1952. An extremely fast Formula Libre car. Must sell quickly £550 O.N.O. – C.N.C.A.Ltd. Bartholomew Street Newbury Berks." In 1953 John Webb became a director of Turner Sports Cars Ltd. and provided some financial support for a single seater Formula 2 racing car to be built. He planned to drive this in British International Formula 2 races, and in sprints and hill climbs. One of Jack Turner's earliest sports car customers was Ken Rose, whose father Hugh was chief engineer at Lea Francis. This contact enabled Turner to obtain a 1767 cc Lea Francis engine, recast in aluminium instead of the original iron. It was enlarged, like Connaughts similar power unit, to 1960 cc and fitted with twin plug ignition and even had the ultra sophistication, for the time, of SU fuel injection. Turner eventually claimed 145 bhp at 6000 rpm for it. This was mated within the new car to an Armstrong Siddeley pre selector gearbox and ENV differential mounted on the chassis. The chassis was a lozenge shaped affair, developed with transverse leaf springing like the sports special, with a 7 feet 6 inch wheelbase and 11 inch Girling drum brakes and Turner cast alloy wheels. John Webb was some way from being an ace and he confined his activities to minor British F2 races in 1953. The car's first race was at Silverstone for the international Trophy in 1953, John Webb qualifying on the back row of the grid for the second heat, finishing 16th and last, in the 15-lap race. In the 35-lap final he finished 19th out of 21 finishers, 3 laps behind Mike Hawthorn's winning works Ferrari. The next race undertaken was for the Crystal Palace Trophy at the newly reopened Crystal Palace circuit, John finishing 9th in a field of 16. Jack Fairman was offered the drive in the Turner for the USAF Trophy race at Snetterton on the 25th July when included in the opposition was Joyce Howard in the Cromard Special that had Wolverhampton connections. Fairman retired after only 2 laps when the engine stopped. It took him some time to realise that he had knocked off the ignition, causing the car to stop. The car was entered for a meeting at Thruxton on the 3rd August but there are no records of how it performed. The team then made the long journey to Charterhall in Scotland on the 15th August when Fairman again drove the car, only to retire when the engine ran its big ends. John Webb was back in the car for the meeting at Crystal Palace on the 19th September when the race was run in two heats. He finished heat one but it is not known if he finished in the second heat. It was Fairman's turn to drive the following week at Goodwood but again the car retired. The final race of the season was at Castle Combe when Webb drove but there is no record of the car's performance. In 1954 Turner adopted a 2.5 litre Alta engine, ready for the jump into Formula 1, but it is not known when and where this engine was used. The season started at Goodwood on the 19th April. Unfortunately for John, the car retired after only one lap. Jack Fairman was back at the wheel for the International Trophy at Silverstone on the 15th May, qualifying 6th fastest for the second of two heats, going on to finish 6th, one lap behind heat winner, Maurice Trintignant, in the works Ferrari. Jack occupied a position on the third row of the starting grid and finally finished 13th, some three laps behind the other works Ferrari driver, Froilan Gonzales, driving the car that Tritignant had used in the heat. The new circuit at Aintree, alongside the grand National Steeplechase course, held its first meeting at the end of May, with the feature race, the Aintree 200, being held for Formula Libre cars. Fairman again drove the car, finishing 9th in the first 17 lap heat. He lined up on the 4th row of the starting grid in a field of 20 starters but, as yet, there is no record of where he finished. John Webb occupied the front row of the starting grid at Goodwood on the 7th June. This did not represent an improvement in performance as the grid positions were decided by ballot, John finishing 5th in a 5 lap race. Jack Fairman finished 4th in the second heat of the trophy race at Crystal Palace, after initially holding second place, but in the final retired with gearbox problems after 3 laps. An entry could not be obtained for the British Grand Prix in July but the car was out again at Crystal Palace on the 2nd August. This was another meeting held in two heats and a final. Jack Fairman achieved 3rd place in Heat 2, going on to finish 8th in the final. Oulton Park was the next meeting on the 17h August. As Fairman came out for the Formula 1 race, the half shaft broke, posting him as a non starter race. A quick trip back to Wolverhampton for a replacement saw the car out later in the afternoon in the Formula Libre race, but there is no record of how it performed. Both races were won by Stirling Moss in the latest Formula 1 250F Maserati. Snetterton a week later saw Fairman completing 13 laps of a 40-lap race before the car was retired with mechanical problems. The fourth race in as many weekends saw Fairman in the car at Castle Combe but the car retired in smoke. The engine was repaired in time for a formula 2 race at Goodwood on the 25th September but problems during practice meant the car did not start, bringing the season to a disappointing end. The Goodwood meeting on the 11th April 1955 was the first race of the 1955 season and races were held for Formula 1, Formula Libre and a short 7-lap race for the old 2-litre class (Formula 2). The Turner was entered with Scotsman Ron Flockhart driving. Flockhart was at this time contracted to the Owen Organisation as a BRM driver. When not required to drive the BRM he was employed as a salesman at Charles Clark's garage in Wolverhampton. It is not out of the way to assume that it was through the Wolverhampton connection that Flockhart was offered the drive. He qualified the car on the back row of the grid and retired after 4 laps. We can only assume that there were problems with the car as it was entered in the following Formula 1 race but was posted as a non-starter. The car did not appear again until it was entered in a race at Crystal Palace on the 30th May, when John ran the car in the first heat of the London Trophy. He was unfortunate to overturn at Ramp Corner when his brakes appeared to have locked on; but he was able to walk away. It was back to Crystal Palace on the 30th July. John failed to qualify for the final from his heat but took part in a consolation race, where he finished third in a four-car field. Two weeks later John entered what was to be the Turner's last race at Snetterton on the 13th August. Unfortunately it was not to be a grand finale as the car retired early in the race. Throughout its career the car was also used in hill climbs and sprints. The Turner was not a very reliable car but provided an enjoyable period for Turner and Webb to compete on a shoestring with the big boys. In 1954 Jack developed a rather ambitious four-cylinder, water-cooled, twin overhead cam, 500cc unit for Formula 3. This intrigued Cyril Kieft, who was building formula 3 cars in Wolverhampton. On paper, the engine looked a winner and Cyril spoke of building a batch of 25 sports cars using it. The one engine which Turner made was run in a Kieft in a couple of hill climbs and was found wanting. Jim Burgoyne drove the car in the 500cc class at Shelsley Walsh in 1955. The engine gave colossal revs but they were not matched by an equal ration of brake horse power and the experiment was hardly a success: it produced only 35 bhp against the 50 bhp of a decent Norton. Although a brilliant design, this motor proved unsuccessful, in the main due to lack of funds to fully develop it. Jack Turner later adapted the dohc cylinder head to a BMC A-Series engine and ran it in a Morris Minor. Jack Turner made a number of Lea-Francis based engines and Kieft used one at Le Mans in 1955 without success. George Nixon from Stoke on Trent fitted a 1.5 litre version into a Lotus Mark 8 chassis. The car was advertised in Autosport in September 1955 when it said that "The engine was the much admired and much publicised 1.5 litre, 110 bhp engine with which he had been experimenting with fuel injection using 2 inch S.U.s. the carburetion is now perfect. The engine had been continually developed during the season and had been consistently developed to probably the most advanced 1.5 litre unit available." In 1955 Turner decided to build a production run of small, open, two seater sports cars, with an Austin A30 engine. It is thought that something like 800 Turners were built. Some enjoyed a fair degree of competition success in British and American club events. Some of these cars were still being raced in the British Modified Sports Car category into the mid 1970s. Towards the end of 1965, due to ill health, Jack Turner decided to call it a day and in January 1966 Turner Sports Cars went into liquidation.